German "sofer" (scribe) of the fourteenth century; generally called Baruk she-Amar, from the initial words of the blessing which he delighted to repeat, even in boyhood, at the early morning service. He was born in Saxony, but later went with his parents to Prague. Orphaned when eight years old, he was adopted by R. Issachar, a learned scribe, who taught him to write tefillin, mezuzot, and scrolls of the Law. Samson apparently traveled through Austria, Poland, Lusatia, Thuringia, and Bavaria, and finally went to Palestine to study the work of the soferim of the Holy Land, where he found that the majority of the scribes were ignorant of the correct tradition in regard to the form of the letters. He endeavored to correct this evil in his work "Baruk she-Amar" (Shklov, 1804), which contains a treatise by R. Abraham of Sinzheim, a pupil of Meïr of Rothenburg, on the making and writing of tefillin, together with Samson's own notes from the "Halakot Gedolot," "ScMaG," "Terumah," "Roḳeaḥ," and other works. This same edition, which is poorly edited, likewise contains the "Otiyyot de-Rabbi 'Aḳiba" and various cabalistic notes on the form of the letters. According to Azulai ("Shem ha-Gedolim," ii. 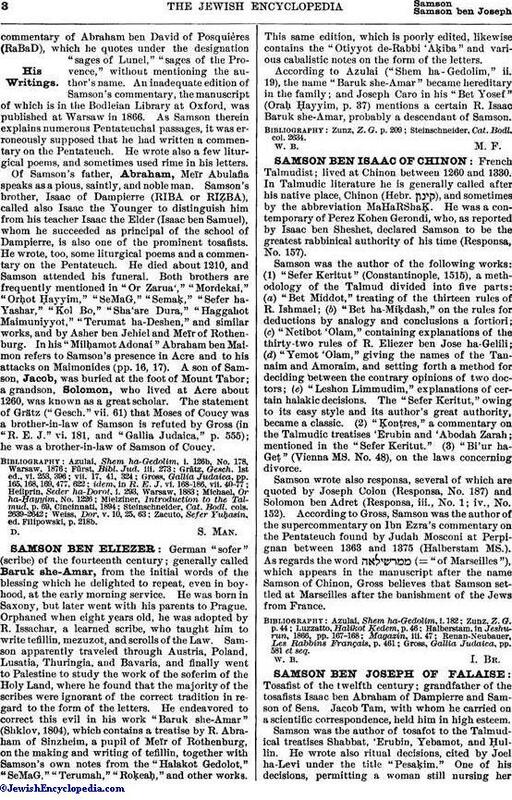 19), the name "Baruk she-Amar" became hereditary in the family; and Joseph Caro in his "Bet Yosef" (Oraḥ Ḥayyim, p. 37) mentions a certain R. Isaac Baruk she-Amar, probably a descendant of Samson. Steinschneider, Cat. Bodl. col. 2634.